This crime report begins: 'The last Speech and dying Words of Margaret Millar, Coal-bearer at Golden-cleugh who was execute 10. February 1726 at the Gibbet of Dalkeith, for Murdering her own Child.' The speech begins: ' My Friends, THE present Age is so degenerate into Vice and Immorality, That they have the Ascendant over Godliness and Vertue; whereas Religion and Piety are run down by manifest Profanity, Dissimulation and Hypocrisy'. As a coal-bearer in the eighteenth century, Margaret Millar is likely to have had little education, and the ornate style of this speech suggests that she had little creative input into her own published last words. This was quite common for the period. Last speeches were a popular subject for broadsides, and broadside authors were practised in making them appealing and affecting to readers. 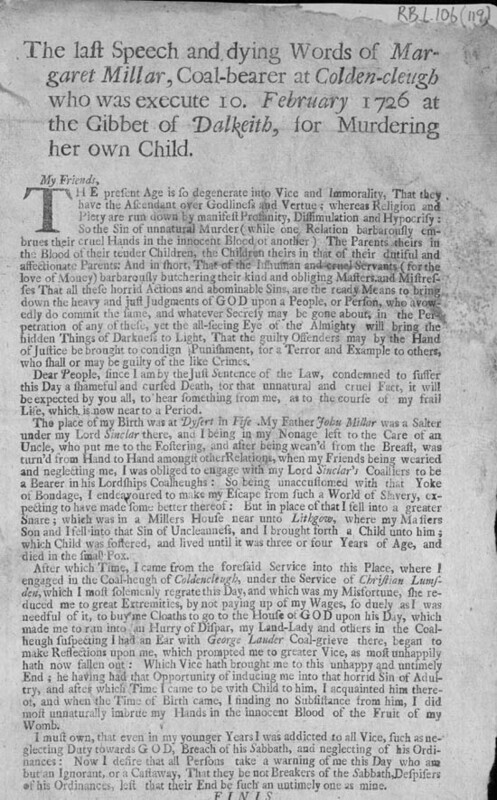 The emotions of guilt and repentance expressed here, while probably genuinely felt by the condemned woman, were also recurring, standard features of this type of broadside report.